How did you get interested in scuba-diving? Quite by accident, actually. I was holidaying in Koh Samui, Thailand, nine years ago and bumped into a British friend who ran a diving school there. He got me interested and eventually hooked. I love to swim so I didn’t mind trying out something underwater. But when I did, I realized there’s a parallel world there, and it is much more wonderful than the one we live in. I travel for work quite often, and I am always looking for beach locations or dive spots to hop into. Was that true of Bali as well? Yes, I was on my way back from Hong Kong and stopped in Bali. I was travelling with some colleagues, and one of them was interested in diving as well (and even if they aren’t, who doesn’t love lounging on a beach?). We would crawl out of bed by 6.30am as the boat leaves at 8am. The first dive was usually around 10am: One stays underwater for about an hour, comes back to the boat to rest for an hour, and then goes in again. I could pack in two to three dives a day, and head back to the shore by 4pm. The rest of the evening was spent enjoying the beach. Bali has some good dive spots and some shipwrecks too. One of the wrecks was particularly interesting as one could walk directly from the beach into the water and dive into the wreck. You don’t need a boat for a beach dive. That would be the Tulamben site? That’s right. A World War II cargo ship, called USAT Liberty, was torpedoed off the coast of Indonesia. It was semi-beached during efforts to tow it away, but then shifted under water after an earthquake in the 1960s. Everything that could be removed from the boat has been removed, but a wing of the boat is still accessible. I remember going into the captain’s cabin and spotting the rusted steering wheel. That’s part of the thrill of diving. Exploring wrecks at a depth of 70-80ft under the sea is an eerie adventure that no diver will forget: It’s like visiting the past. It was, but the best such site that I have dived in is in the Red Sea, off Sharm el-Sheikh in Egypt: It was my most memorable dive in nine years. The British ship, Thistlegorm, was sunk by a torpedo from a lone German bomber in November 1941. Despite all these years under water, it was well maintained. We entered the ship through the hole made by the torpedo, and swam out through the exit point. Inside, we saw Norton motorcycles and jeeps, still intact. In fact, we half expected skeletons to come floating past us. I’ve done dives at the Great Barrier Reef, Florida Keys, multiple locations in Thailand, Maldives, Mauritius and Puerto Rico, but I would rate Sharm el-Sheikh as one of the top dive areas in the world. Bali doesn’t quite match up to those standards. A whole lot of factors make a dive site great: The sheer clarity of the water, the abundance of marine life, the possibility of a variety of dives—ranging from wreck dives to reef dives, deep dives to rift dives—all matter. On these counts, Egypt was far superior. The Sharm el-Sheikh site also offers night dives: We went in around 7.30-8pm, after the sun had gone down, and the only light came from the torch attached to our headgear. Night marine life is completely different from what one sees during the day: All the fish that sleep under rocks/corals during the day come out at night. The beach in Bali, though, is dark volcanic rock, which doesn’t make for very good visibility. Corals, too, are less here than in some of the other dive sites I have seen; even the sea life was slightly disappointing, though we did see morey eels, barracudas and turtles. In fact, I gave a 3ft-long turtle quite a chase till it finally got scared and moved away: One can’t really follow them after a certain depth. Not quite up there in the thrill factor was my encounter with a sleeping nurse shark off the coast of Miami in the Florida Keys. The shark was just 15ft away and began moving towards us—it made for a strange combination of fascination and extreme nervousness. The thing is, sharks are intrinsically afraid of humans (don’t believe Spielberg), and most sharks attack when they mistake humans for fish. Thankfully, our friend’s olfactory senses were in order, and it just moved on and away from us. Do you normally travel with your own gear? No, I prefer to rent the gear at the dive location rather than lug my own stuff around. It is not light—it would include the regulator (oxygen tank), BCD (buoyancy control device), fins, mask, snorkel and wetsuit. Is it necessary to sign up with a dive operator? It is normally recommended to sign up with local dive operators, as they know the good dive spots to go to and which are the safe areas. And it is essential to check that the operator is Padi (Professional Association of Diving Instructors), SSI (Scuba Schools International), CMAS (Confédération Mondiale Des Activités Subaquatiques) or NAUI certified (Padi is the most widespread globally). If you have been diving for a while, a good way to identify a dive school or operator is through a simple Internet search. Any out-of-the-water experiences that you carried back from Bali? Unfortunately, Bali was a short trip, and when I wasn’t at the Grand Hyatt, I was either under water or on the beach. I remember this great resto-bar that we went to, a very sophisticated place with low seating and great cocktails, but the name escapes me completely! 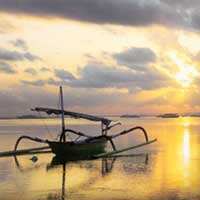 Jet Airways flies between New Delhi and Denpasar, capital of the Bali province. Return economy fares start from Rs66,000. From Mumbai, Singapore Airlines offers good connections; fares start from Rs58,000.